Tunisian crochet, sometimes called the Afghan stitch, combines the ease of crocheting with the appearance of knitting. 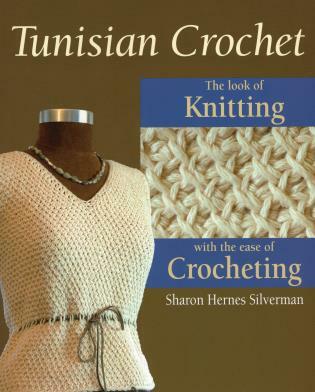 This instructional pattern book brings Tunisian crochet into the realm of high fashion with exquisite stitch patterns, meticulous shaping, and attractive finishing. Sixteen chic projects for apparel, accessories, and home decor are explained in detail. Readers will learn how to make wearable items such as a chain mail scarf, child's jumper, honeycomb skirt, and man's vest. Home decor projects include an ottoman cover, placemats, afghan, pillow, and more--all using Tunisian crochet techniques. Sharon Hernes Silverman is a writer and crochet designer in West Chester, Pennsylvania. She is also the author of Tunisian Crochet (978-0-8117-0484-7), Crochet Scarves (978-0-8117-0081-8), Crochet Pillows (978-0-8117-0646-9), and Tunisian Crochet for Baby (978-0-8117-1287-3). Alan Wycheck is a concrete specialist and former partner in The SO Factory, a concrete design company. He is also an award-winning photographer and lives in central Pennsylvania. David Bienkowski is an oil painter, illustrator, and graphic artist who currently resides in California's Central Valley.